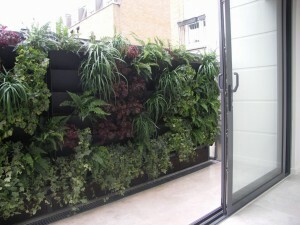 In the smallest of spaces, a green living wall creates instant impact. It connects us to nature and gives us an ever-changing ‘plant painting’. Just having a show of plants at close range provides a feeling of well-being and interest. 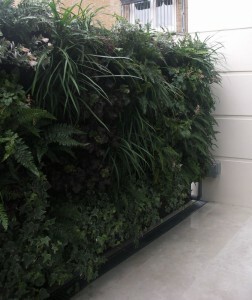 Hanging on a sturdy metal-framed fence, this living wall is the outlook through beautiful new patio doors of a flat in Islington. 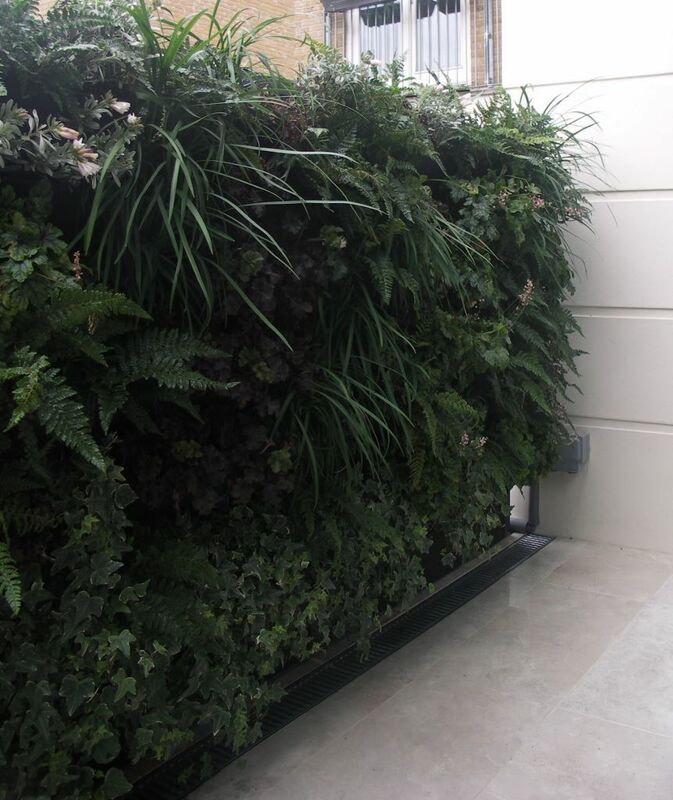 It uses rigid planting boxes with special substrate and an automatic irrigation system. It is very easy to maintain. I thought of the planting design as a green textured carpet with a simple flowing pattern of plum heucheras and green Heucherella ‘Tapestry’ which has lovely dark markings. The strappy leaves of liriope give an extra dimension and flutter in the breeze. The fern, Polystichum blepharum provides a dark green backdrop of glossy leaves. 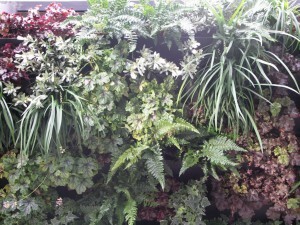 Most of the planting is evergreen so that the living wall looks good all year. The lower levels get very little sunlight, so shade loving plants are used. Flowering interest is provided by delicate pink and white plumes from the heuchera and heucherella, blue flowers of ajuga and Brunnera ‘Jack Frost’ and white flowers of the silver cascading Convulvulus cneorum. 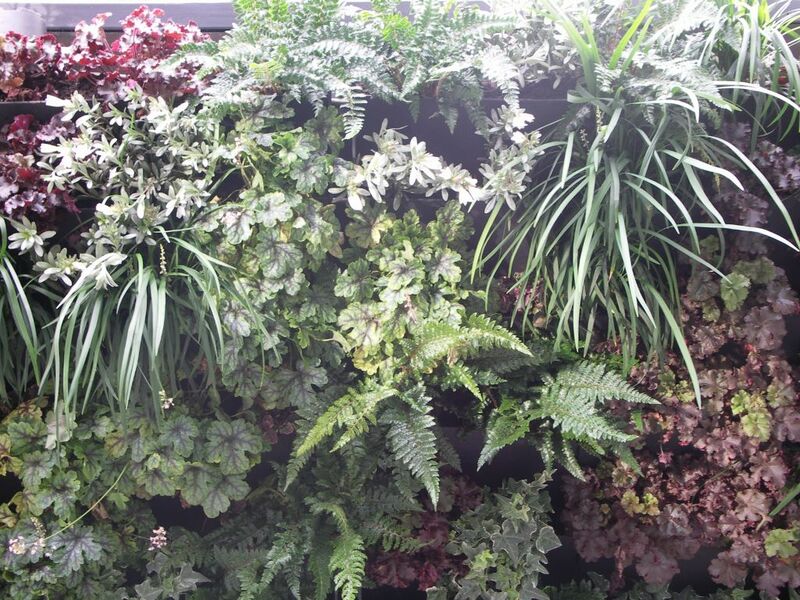 As the plants grow, the living wall will be completely covered with foliage. Ferns and liriope add texture, pale pink flowers of heucherella add interest. This entry was posted in Living Wall and tagged Brunnera 'Jack Frost', Convulvulus cneorum, Garden Design, green textured carpet, Heucherella 'Tapestry', Islington, Leaf & Acre, Living Wall, North London, plant painting, Planting Design, Polystichum polyblepharum on November 17, 2015 by admin.